Just like electricity powers electric power tools similarly, air supplied by an air compressor is used in powering pneumatic tools and air tools. Air compressors have come a long way, and they ensure that our present-day life is possible. Look at all the gorgeous things around you, the house you live in, the skyscrapers you see, the car you drive, the airplane you fly on and many other things are possible because of machines are known as air compressors. Most of the tools used today in making and creating things used every day are powered via an air compressor. But which air compressor to buy? With so many options in the market, it can be difficult to invest in one air compressor. So f you are looking for the air compressor to invest in and want to read the review then you have come to the right place. Air compressors make use of the latest innovative parts and components to reach your needs and ensure that you carry out your best work. Mentioned below are some best air compressor present in the market today. Keep on reading this review to find out which air compressor should you invest in. This air compressor is one of the best 20-gallon compressors in the market. 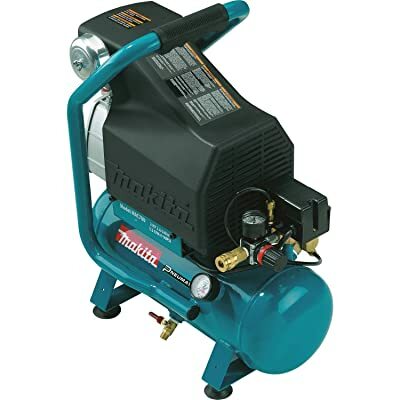 There is no doubt that this is a little pricey machine and other 20-gallon air compressors may be a little cheaper but think of it like this; would you rather fly first class in an airplane or in a commercial airline. When it comes down to products like this, the main difference is the price. You may end up paying for more for a similar product, but after using it and seeing its result, you will get your money’s worth. 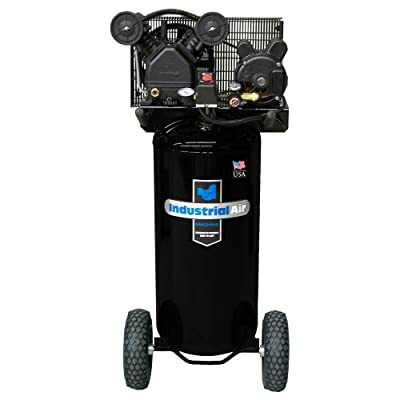 With the Industrial Air IL1680266, you will get a compressor with a storage tank of 20 gallons, and this is the same for other 20-gallon air compressors. But what makes this compressor special is the type of pump it comes with. This compressor is equipped with a coast iron v-twin cylinder single stage pump. This can be considered as two pumps in one. Here the compression of the air takes place in both the cylinders at the same time, and so more compressed air is produced at a time. This is directed in the cylinder at ones. If you are using tools that consume more air than usual, then this compressor is perfect for you. Since the pump in this compressor is producing more air at a time, it can keep up with air hungry tools such as a sandblaster or a die grinder. However, keep in mind that you will be using one tool at a time. With this compressor you get a heavy induction motor; this motor is wired for a power outlet of 120 volts and so can be easily operated in your normal 120-volt outlets at home. This machine can withstand a maximum pressure of 135 PSI, and this is enough pressure for most air tools. This machine is an ideal machine and is very portable. It comes with pneumatic tires, and since it is heavy, you can move it easily for one place to another. Once the tank is filled up, it will shut down automatically. Is quiet doesn’t make a lot of noise. Even though the Makita MAC700 is a small air compressor, it does has its peaks. When you grab this air compressor, you get a single cylinder compressor that has the ability to fill up quickly. That’s not all; this air compressor makes no noise. This compressor can get filled up in merely 2 minutes. The reason behind this quick timing is the type of pump it comes with. The cylinder of the pump has a greater bore, longer stroke length, and a large piston to go with this machine. For this reason, this compressor can take in a lot more air and fill up the 2.6-gallon tank faster than any other pumps of this class. Another thing to focus on this compressor is that the pump of Makita is oil lubricated. These oiled compressors have the ability to run cooler and last longer than most compressors without oil. This oiling is another reason why Makita runs quietly. This compressor is equipped with oil sight glass; this gives the user the ability to check the level and color of oil present in the compressor. Has quick recovery when the air in the tank is low. Has high performance and a strong built. The Bostitch BTFP02012 and the Dewalt DWFP55126 are very similar air compressors. The major difference between the two is that they are made by different companies. 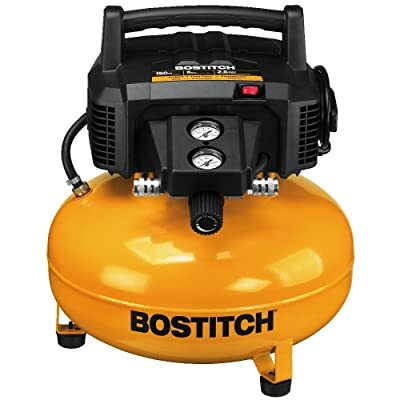 Bostitch is also an oil-less compressor and requires less maintenance. This compressor has a storage tank of 6 gallons and produces a maximum pressure of 150 PSI. At this compressors standard pressure of 90 PSI, this compressor can produce an SCFM of 2.6. The tools you can run with this compressor are staplers, finish nailers, framing nailers fill tires and even mattresses. If you are going to use tools that will not take more than 2.6 SCFM, then this air compressor is enough. However, this compressor is oil-less, and so it won’t be easy on your ears. This machine makes noise when being used so you will have to grab an ear protector. Bostitch BTFP02012 has a high-efficiency motor that will help in keeping the compressor pump running even in cold climates. With its two couples, you can use this air compressor with your friend at the same time. 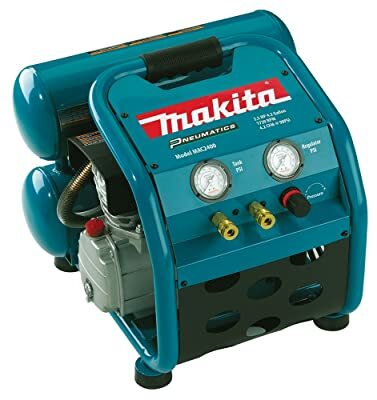 This is one of the best portable inflation compressors that you can grab in the market. It aims at meeting your fastening and inflation needs easily. Meets all your needs for home improvement projects. This is a portable air compressor. 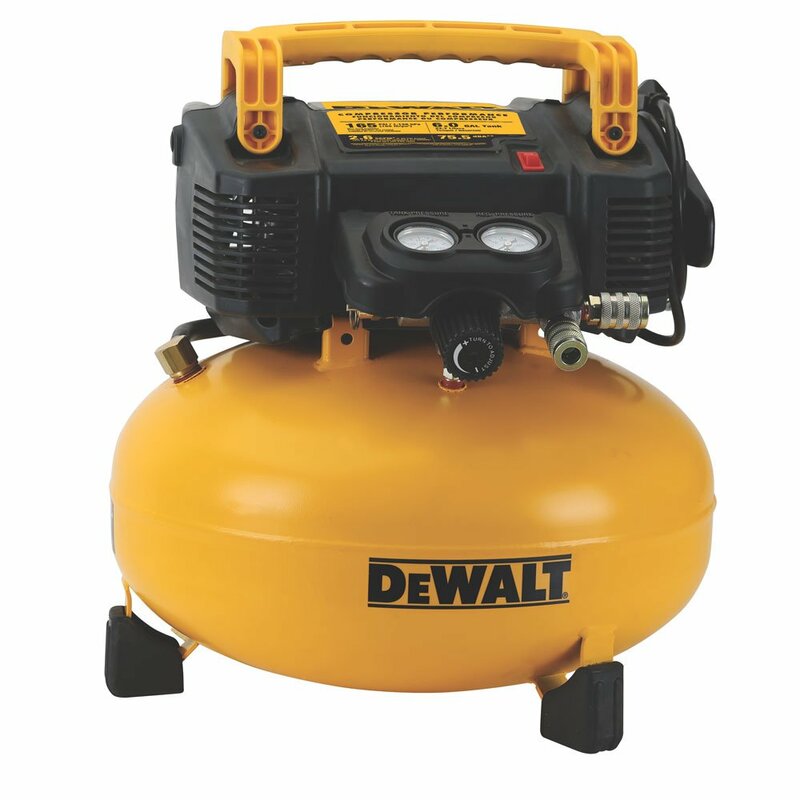 If you are looking for an air compressor that can tackle high demanding projects for example like framing a whole building then this DeWalt DXCMPA1982054 air compressor is the one for you. this compressor has the ability to produce up to 5.7 CFM of air at a PSI of 90. This means that you can use this compressor for more air hungry tools. For simple tools, you can use this compressor to increase their work time before pressurizing the tank once again. This compressor is equipped with cast iron, oil-lubricated pump, and a twin cylinder. Due to oil lubrication, you can say bye to noisiness. This compressor can easily be used in your garage, however, keep an eye on the oil and make sure it is enough. The pump of this compressor is powered by a heavy-duty induction motor, and this ensures that the compressor runs easily. Using the compressor and regulating is very easy and this is also a very portable compressor. DeWalt comes with 2 pneumatic wheels as well as a handle that makes it easy for the user to carry it around. This is a very quiet machine. You can run household tools as well as heavy duty tools on this compressor. It is very portable and easy to use. Maintenance is required of this compressor. Like the MAC700, this Makita air compressor comes with an equipped big bore pump and helps in easing the recovery process of the compressor. Unlike the MAC700 2.6 gallon storage tank, Makita MAC2400 is equipped with a 4.2-gallon tank. This provides this compressor with a faster runtime before needed recovery. This air compressor is capable of holding a maximum pressure of 130 PSI. It also produces 4.2 FM of air at an air pressure of 90 PSI. With MAC2400 you can run two tools at a time. This machine also has a back dial to lower or raise the pressure as needed. This compressor is oil lubricated, so it not only runs cooler but is also quieter. This machine also has a low RPM motor run as compared to other air compressors of its class. It can run two tools at once and has a dial to control pressure. It has to be maintained and well oiled to work properly. If you are looking to buy a very quiet air compressor, then California Air Tools is the one for you. This compressor is simply terrific. This is an 8-gallon air compressor and has the ability to produce 2.2 CFM of air at a pressure of 90 PSI. This compressor can store and compress air up to a maximum pressure of 120. The best part about this California Air Tools 8010 is that this is an oil-free compressor. However, it is quieter than even some oil-lubricated air compressors. If you want a quiet air compressor, this is the one for you. This compressor has the ability to be filled in less than 3 minutes and can recover back in less than 30 seconds. Since it is an oil-free lubricated compressor you do not have to maintain is much. This is an incredibly quiet machine. It is an oil-free compressor and does not require a lot of maintenance. It has a great performance and is not very expensive. Does not come with rubber tires. If you do not need to use an air compressor all the time for heavy projects, then this compressor is the one for you. this compressor is ideal for carrying out little DIY projects and can fit your needs perfectly. As the California Air Tools 8010, this one is also very quiet even though it is oil-free. This air compressor has a dual piston pump that allows you to fill the tank very quickly. This air compressor is geared to use it at home due to its small capacity of the tank. However, its small capacity means that this compressor is lightweight and can be carried around easily. If you need a small portable air compressor, then this compressor is for you. 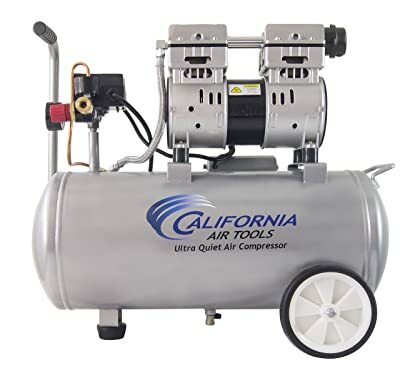 If you are looking for an air compressor that has the ability to handle non-demanding household projects or to carry out small handyman services, then this gallon air compressor is perfect for you. there is much 6-gallon air compressor in the market. 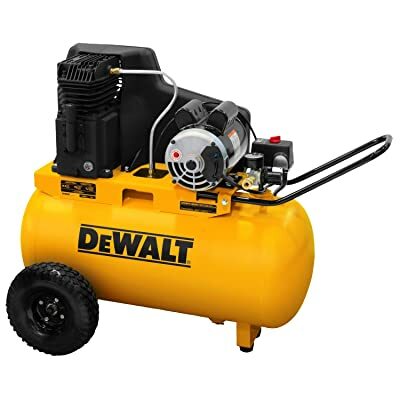 However, DeWalt is one of the best air compressors that provide you with your money’s worth. This air compressor has the ability to produce 2.6 SCFM of air at a pressure o 90 PSI. if you require a higher pressure of air, then this machine has the ability to produce air at a maximum pressure of 165 PSI. This maximum pressure is enough for home improvement services. Many 6 gallons compressor make a lot of noise ranging from 70 to 80 decibels. This makes the compressor very noisy; however, with Dewalt, you can say goodbye to these noises. You can have a conversation while making use of this compressor. This compressor is oil-free or oil-less; this means that you do not have to add in oil while using it. This makes this machine less maintenance. 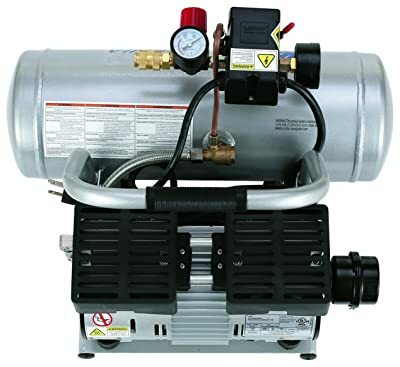 This compressor has a high flow regulator allowing you to regulate the amount of pressure of the air compressor. This DeWalt air compressor has a ball drain verve present at the bottom; this allows you to get rid of any stored up air in the tank. This compressor is very lightweight and can easily be carried from one place to another. Even though this compressor is more expensive than other 6-gallon air compressor, it is worth spending your money on. Stationary compressors are ideal for in shop and garage replacements. With high-horsepower motors and a large storage tank that allow durability and uninterrupted use, with intelligent designs that help save floor space and room. Pancake air compressors come with circular storage tanks that are placed on the very bottom of the air compressor. These compressor are designed in such a way that helps in saving space. WHEELBARROW compressors also have two horizontal cylindrical tanks with features that include wheel and hand support allowing you to easily carry it around. These portable compressors are also light in weight. The most common models of an air compressor are the electric compressors models. These compressors require very little maintenance as compared to other models such as gasoline powered. They are quieter and are feasible for any dry area with a steady supply of electricity. They are the best indoor compressors. Many compressors used for household can function on a voltage of 120 volts; however, large models have other necessities. A portable compressor, on the other hand, requires extensions which limit mobility. Depending on various models inflators plug into a 120-volt household outlet or a 12-volt vehicle outlet. The horsepower (HP) of an air compressors shows the power output of the compressors motor or engine. The higher the horsepower the greater the air pressure; air pressure is measured in PSI. Higher PSI means more storage in the air tank allowing the air tools to be operated for a longer period of time. CFM- Cubic feet per minute and SCFM- standard cubic feet per minute, outlines the volume of air delivered the compressor at a specific PSI level. As the PSI changes so does the CFM value. As PSI decreases CFM increases. A compressor with a higher CFM rating will provide the user with more air and is best suited for heavy applications such as framing nail guns and air wrenches. Smaller tanks(that carryaround 4 to 6 gallons )are adequate for various projects such as nail guns, air brushing etc. Larger tanks have a more storage capacity for air and are suited for larger tasks. Each air compressor has its own qualities and features. Choosing one of all these can be a very biased decision. Some air compressors are ideal for high quality works whereas some are great for small handyman jobs and household features. All of these air compressors are one of the best air compressors. Make sure to pick the one most suited to your needs and then do your research in it so that you invest in the right place.